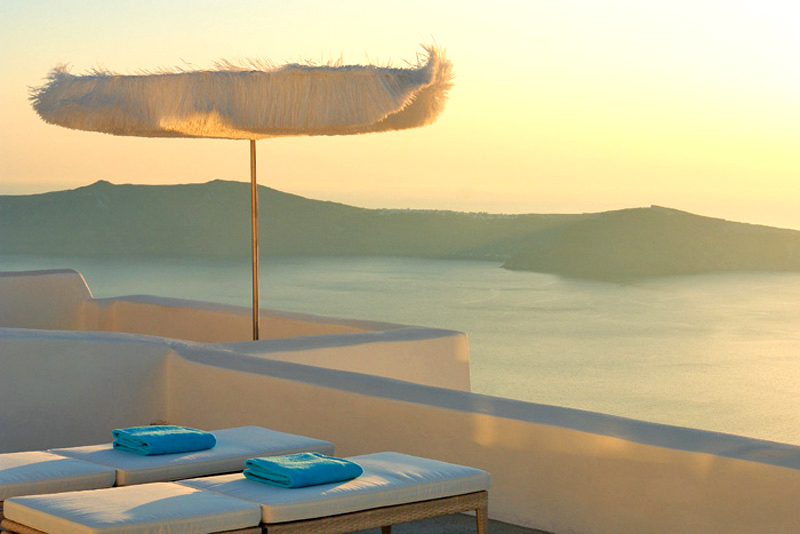 Built on the highest point of the caldera, in Imerovigli village, White Hotel offers its guests exceptional service in an idyllic environment complimented by breathtaking views. Apartment: (25 sq. m.) spacious bedroom with queen size double bed, living room, furnishing of Mia collection, luxury bathroom (10 sq. m.) with shower cabin. Outdoor: large shared terrace (80 sq. m.) in front of the main pool of 20 sq. m. Maximum occupancy: 2 persons. Superior Apartment: (30 sq. m.) spacious bedroom with queen size double bed & living room. Furnishing of Mia collection. Large luxury bathroom (10 sq. m.) with a shower cabin. Outdoor: large shared terrace (80 sq. m.) with a small pool of 5 sq. m /or a private heated Jacuzzi of 3 sq. m. Maximum occupancy: 2 persons. Junior Suite: (30 sq. m.) spacious bedroom with queen size double bed & living room, furnishing of Mia collection, luxury bathroom (10 sq. m.) with a shower cabin. Outdoor: large private terrace (20 sq. m.) with a private heated Jacuzzi (3 sq. m.) Maximum occupancy: 3 persons. White Cream Suite: (30 sq. m.) luxury furnishing by Mia collection, wooden round queen-size bed. Luxury bathroom (5 sq. m.) with bathtub. Outdoor: large terrace (40 sq. m.) and private pool (12 sq. m.). Maximum occupancy: 2 persons. White Pearl Honeymoon Suite: (20 sq. m.) luxury furnishing by Mia collection, wooden round queen-size bed. Luxury bathroom (6 sq. m.) with a shower cabin. Outdoor: Private entrance, private terrace (20 sq. m.) with a large private heated Jacuzzi ( 6 sq. m.). Maximum occupancy: 2 persons.